It may well be the best way of removing that unwanted hair, but finding the right epilator that will do an excellent job of removing your hair, keeps the pain to a minimum and won’t harm your skin is not an easy task. On the market there are number of epilators, some good, some not so good. They will remove the hair, but in some cases they will leave your skin irritated and the redness will last for days. That is why if you are looking to buy a good epilator you need to do some research. This article focuses on one specific epilator, Braun Silk Epil 9 9-561, the latest in the best selling Braun range, which has proven to be very efficient in removing hair without leaving any redness on your skin. Braun Silk Epil 9 9-561 is small and as with the rest of the range, it is easy to use. This epilator is convenient for both wet and dry epilation, meaning you can use it in the shower or bath, which is great not only for cleanliness but for pain too, as using water has been known to help greatly with the discomfort some people experience. It is a cordless epilator which makes it be practical and portable machine. It allows you to remove the hair from your body very fast and keep it smooth in the next 4 weeks. This epilator has a head which is 40% wider than other machines of the same type. This enables you to remove more hair at the same time. The tweezers are not only wider but they are also deeper and longer. They can easily penetrate into your skin and remove even the hair which is usually too short even for waxing. So you can forget about having “to grow” your hair for weeks in order for them to become long enough. 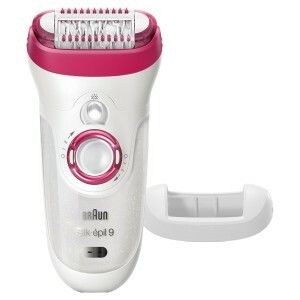 This epilator has six added extras in total including the shaver head, trimmer and massage cap, skin contact cap and a facial cap. It also has a charging stand that will make sure your epilator is fully charged and prepared for future use. The massage attachment will significantly decrease the discomfort you would usually feel during epilation. If you remove the hair on regular bases, in time you won’t be able to feel any pain. Moreover, the new hair will be thinner and lighter, meaning you will hardly be able to notice them, and they will be easier to remove the next time. The other attachments allow you to use the epilator on other parts of your body such as the arms and underarms, your face or the sensitive bikini area. It is very convenient for those who have easily irritated skin because unlike many epilators, Braun Silk Epil 9 9-561 doesn’t pull at your skin while removing the hair, and avoids redness or pain. Hopefully this epilator has the features you are looking for in your skin’s next best friend. The price is high, but not when you consider the amazing quality it offers. Imagine the amount of money you will save by not having to buy waxing strips and spend hours in the bathroom trying to remove all your hair by shaving. This offers value and the most exceptional quality you can get in the world of epilation. Welcome to Best Epilator Guide. Our website is designed to offer reviews, news, information and tips on hair removal and specifically, Epilating. We think this is one of the best methods to deal with unsightly hair and lasts way longer than shaving, and is easier and less painful than waxing. We've got loads of product reviews here featuring brands such as Braun, Emjoi and Panasonic among others. Epilating can be painful, and buying an Epilator in the first place can be expensive, but is it worth the money? And is the process worth the pain?